Several professional architects, craftsmen, dilettante designers and friends contributed ideas and sketches. These included the architect Edward Blore, the cabinet-maker, George Bullock and Scott’s friends, the artist James Skene and the actor Daniel Terry. But the principal architect was William Atkinson, who was later responsible for the remodelling of Chequers in Buckinghamshire. The interiors were decorated by David Ramsay Hay of Edinburgh, who went on to redecorate the Palace of Holyroodhouse for Queen Victoria. Inscape has arranged exclusive occupancy of an original wing of the House. 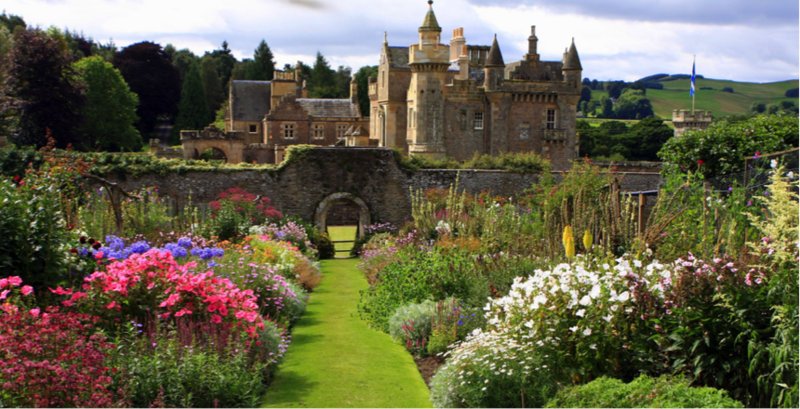 This extraordinary opportunity served as impetus to plan a series of journeys in search of other sources of Scottish Romanticism: to the dazzling, almost hallucinatory, Rosslyn Chapel near Edinburgh; to Dryburgh Abbey where Scott is buried; to Melrose Abbey whose architecture so inspired him; and to ancient Traquair lived in by the Stuart family since 1491. Jenni Calder , author and leading historian of early 19c Scotland will lecture on Sir Walter Scott and the myths of Scotland. We have arranged for Dr John Dent, principal archaeologist of the Scottish Lowlands to accompany us on a day long excursion to Kelso, Melrose and Dryburgh Abbeys, Catherine Maxwell Stuart Laird of Traquair, her ancestral home, warmly welcomes and hosts our visit. We pay homage to some of the greatest glories of Scottish, indeed of European, medieval architecture.